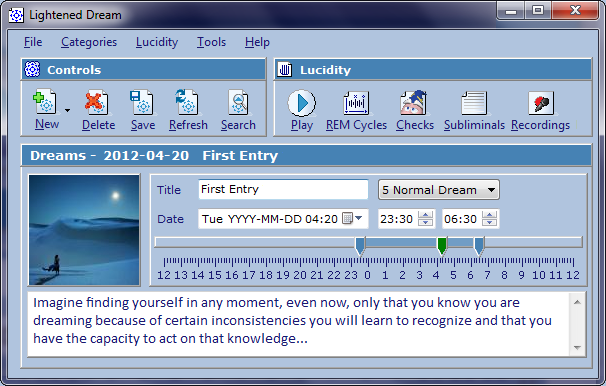 Lightened Dream 3.2.1 Free Download - A dream journal designed for dreamers in search of lucidity. Dreams are automatically organized by date for easy navigation and can be expanded to show common keywords and how they relate to other dreams. Play sounds in the middle of your sleep. Adjust the cycle length to predict when you will be dreaming and drag and drop a song or recording to be played during your rapid eye movement phase. Guaranteed to manifest in some form in your dreams when you get the timing right. Statement: First, please download the orginal installation package by clicking the download link. Of course you may also download it from the publisher's website. Using Lightened Dream crack, key, patch, serial number, registration code, keygen is illegal. The download file hosted at publisher website. We do not provide any download link points to Rapidshare, Hotfile, Depositfiles, Mediafire, Filefactory, etc. or obtained from file sharing programs such as Limewire, Kazaa, Imesh, Ares, BearShare, BitTorrent, WinMX etc. Software piracy is theft. If you like Lightened Dream please buy it.